PARIS (Reuters) - For two years Airbus faced a shortage of engines and had to slow jet deliveries. Now engines are arriving fast - but fresh snags mean a Hamburg plant that assembles best-selling jets is having trouble absorbing them, industry sources said. 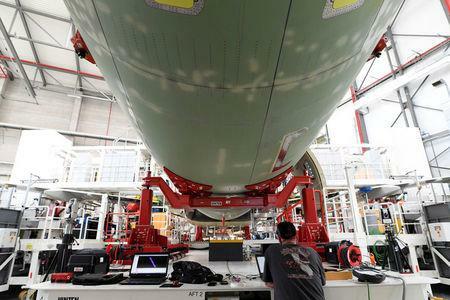 Airbus is working flat out to maintain this year's target of 800 total aircraft deliveries needed to meet financial goals and single-aisle assembly lines are its most important cash cow. That illustrates a wider challenge as planemakers struggle to introduce new models and fix technical issues without pausing record output increases – a task some compare to taking the steepest hill in a cycle race at a sprint while fixing a tyre. An Airbus spokesman confirmed the customized new A321neo version had "led to some rescheduling of aircraft deliveries," in combination with pressure from output increases and the queue of jets still waiting to be delivered from the engine crisis. "Airlines can deal with planes that are off-spec but not ones that are late. They have built a network plan which takes account of new aircraft in the fleet," Ascend chief consultant Rob Morris said. Boeing has also had some delays. Hamburg's woes highlight the operational issues at stake as planemaking chief Guillaume Faury prepares to become chief executive in April. His two main industrial lieutenants, Tom Williams and Didier Evrard, retire at end-year.